Loose and messy watercolor with rose gold heat embossing and several tiny felt flowers is the recipe for this simple and quick card with a touch of pink and teal. I’ve been wanting to use the Thanks border die for a long time, but I just couldn’t find the perfect card idea for it. I did use it on this card here, but still it didn’t quite seem right. 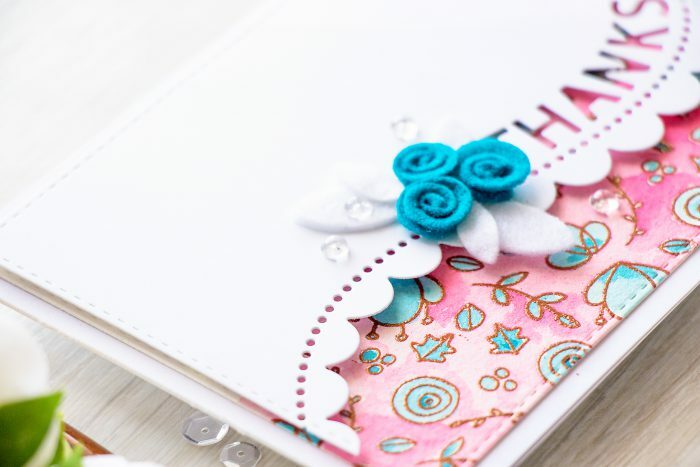 I started making this card by die cutting a white cardstock panel using the largest die from the Stitched Rectangle set and trimmed is using the Thanks Border die. I really like how elegant and feminine this die cut looks (especially when cut out of white). 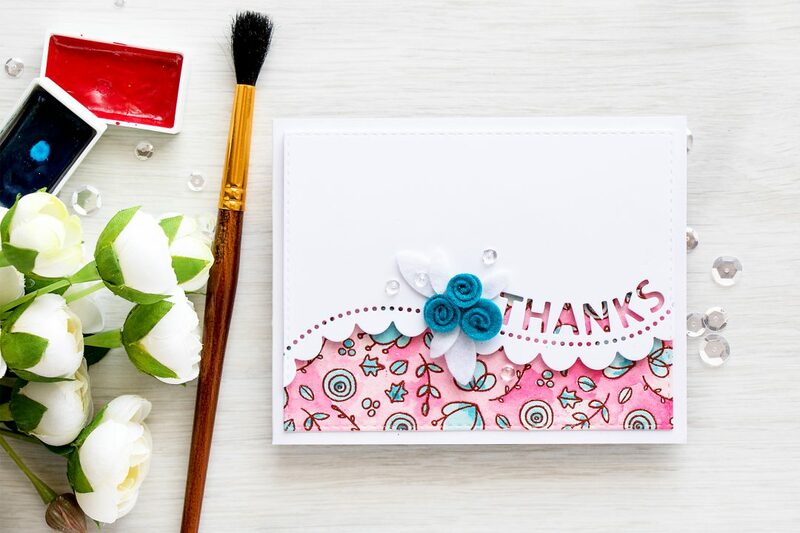 To help the thanks die cut stand out on the card I also die cut an identical Stitched Rectangle panel out of Arches watercolor paper; heat embossed tiny florals and leaves using Simon’s Rose Gold embossing powder and loosely watercolored using teals and pinks. The thanks die cut was than foam mounted over the watercolor background (and by the way I didn’t heat emboss and did not watercolor the entire panel, just the bottom part). I felt I needed to add a few additional touches to this simple card, so I grabbed my Plush Daffodil and Daisy die and teal and white felt and die cut several flowers and leaves (I used another die for the leaves – from the Bunny set). Lastly I added several clear droplets from Pretty Pink Posh and adhered my panels onto an A2 white card base. Amazing! I’d never thought I’d f combining felt and watercolor. Color combo is stunning! Very pretty card! thank you! Believe it or not – I wasn’t sure if I should share this card, I really didn’t quite like it at first. so happy I posted it here! thanks! I’m just seeing your card now, it’s beautiful and inspires me! Beautiful card, I especially like the color combination. Can’t wait to mix felt and watercolor. The textured watercolor paper really ties everything together. Love it!